Last month, the music world was stunned by the sudden passing of musician Stewart Lupton, the enigmatic frontman of New York via D.C. indie pioneers Jonathan Fire*Eater. The 43-year-old help put New York rock and roll back on the map in the mid-to-late 90s when Jonathan Fire*Eater relocated to the Big Apple from the capital and caused one of the largest label bidding wars in history at the time. Jonathan Fire*Eater had a sound unlike many others at the time with jingle-jangle guitar hooks, thumping rhythms, and sinister and dark lyrics that were showcased via Lupton's unique voice. Dreamworks eventually won the band on their label after the bidding war and they released their critically acclaimed but commercially flopped Wolf Songs for Lambs in 1997. After they signed their lucrative deal with Dreamworks, the L.A. Times called the band "possibly the most hyped young group that nobody has ever heard of," in the era before social media that was a bold but accurate statement to make. The album would basically set the standard for New York City bands of the early millennium like Interpol, Yeah Yeah Yeahs, The Strokes, and Secret Machines. Wolf Songs for Lambs would be the template that those artists would use for their respective debuts and early styles. Wolf Songs for Lambs now sounds just as fresh as it did 21 years ago and the oral history of the record was displayed in Lizzy Goodman's brilliant 2017 book, Meet Me in the Bathroom. A year after the record was released, the band split and members Paul Maroon, Matt Barrick, and Walter Martin would later form the critically acclaimed indie band The Walkmen. 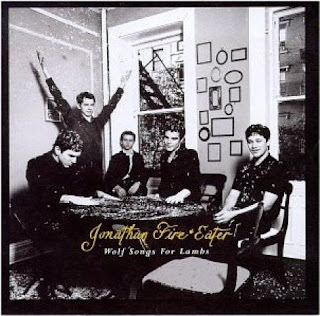 While Jonathan Fire*Eater received their acclaim from critics and the NYC and DC audiences that flocked to see them and not from the masses, the influence they had is something no one can argue and their legacy is a testament to that.